I have a really fun and trendy tutorial for you. 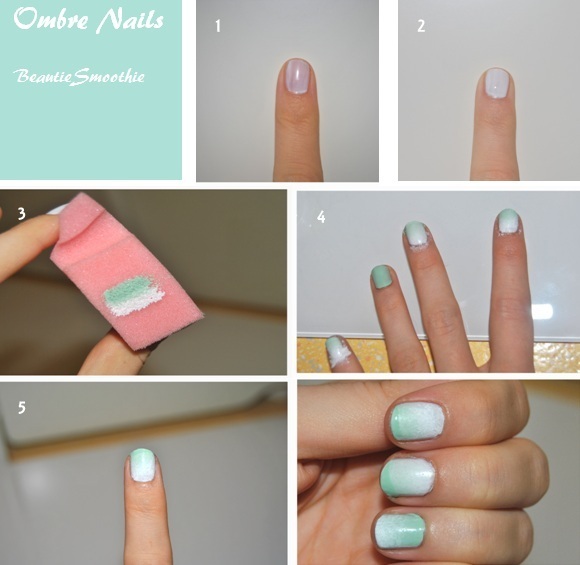 You may already be familiar with this nailtrend, ombre nails. Ombre means shading in French, it's shades or colorpallettes that go from dark to light. Youhave probably seen the ombre hairstyle a lot the last two years. Celebs like Khloe Kardashian, Rachel Bilson and Lily Aldridge have been rocking it. I really like these natural looking hairstyles, so obviously I'm excited this is coming through in fashion, make up and nails! 1. Put a coat of nailpolish on your nails. Any color you like. 2. Put a second coat of the same nailpolish on your nails, to make it opaque. 3. Take a sponge, cut it about the size of your nail (a little bit bigger, will apply easier). Put your two nailpolishes on the sponge like shown in the picture. Overlap the colors a little bit in the middle to create the ombre effect. 4. Use the sponge on your nail, dap it on. Do not keep dapping it because you think the colors aren't visible enough. Let your nail dry and put on a second coat. 5. The nailpolish is on, only need to clean it up a little. Take a cotton pad with some nailpolish remover and clean the edges up. 6. Put a top coat on your nails to make the colors last longer and to avoid your nail from chipping. 7. You are done! Show your cool nails off and experiment with some original color combinations!